Often I am asked by citizen’s why at AiREAS we measure in city quarters instead of dense traffic routes. The answer is that we decided to measure close to where people live in order to link pollution directly to lifestyle and environment rather than just traffic. The traffic part has been analysed often enough. There is no need to keep proving what we know already. Government is beginning to take health seriously but still combats with political and economic stress in defining priorities. Citizens are strong at pinpointing at responsibility of others including their government but often forget their own within a specific culture. Modern city governments often already started to take on responsibility for health but strand on self inflicted culture. One cannot simply close off roads if this affects access to commercial areas on which taxes and labor depend. Citizens who live near traffic arteries often have cars themselves and think differently when at home and in their car. Showing citizens AND governments that a healthy city is responsibility of both is AiREAS. In this exercise we show how pollution extends throughout the city often behaving worst within the city quarter than along the mayor traffic arteries. It all depends on the type of activities in the city and the weather. 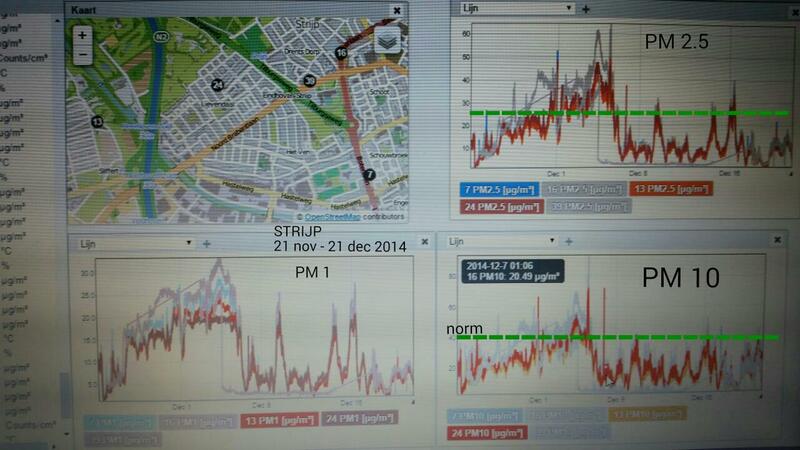 In every picture you find the city area, the measurement location and the combined results of PM 1, 2.5 and 10. 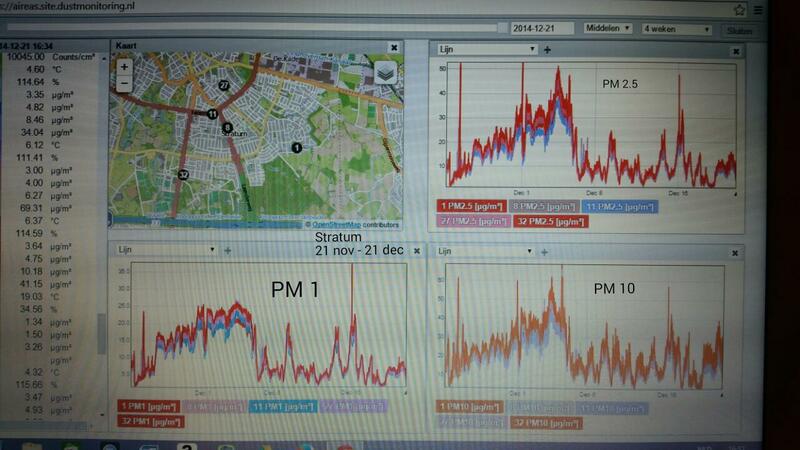 Petten/Eindhoven, 15 december 2014 – The network of AirBoxes with which air pollution is measured in the city of Eindhoven (Netherlands) has today been enhanced with NO2 sensors. As from now, together with fine dust and ozon, also nitrogen dioxide will be measured, a substance that is mainly emitted by traffic. 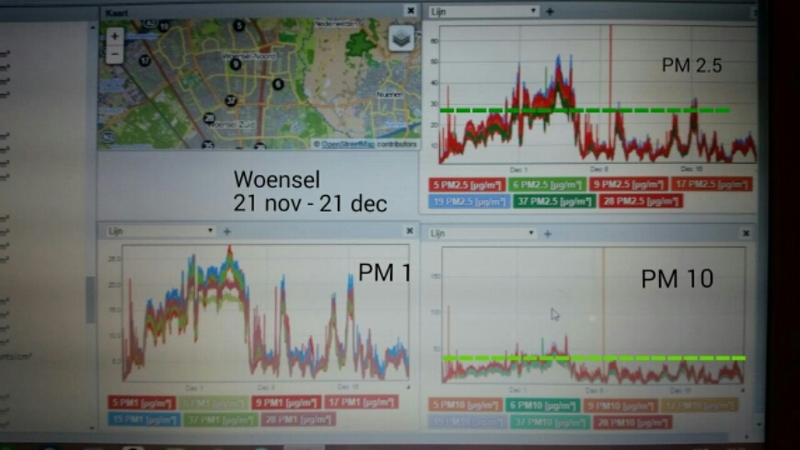 Since end 2013 Eindhoven counts 35 AirBoxen spread throughout town, measuring fine dust in different sizes (from 10 micrometer to as small as 1 micrometer) as well as concentrations of ozon. The measurements are being executed by newly developed sensors. 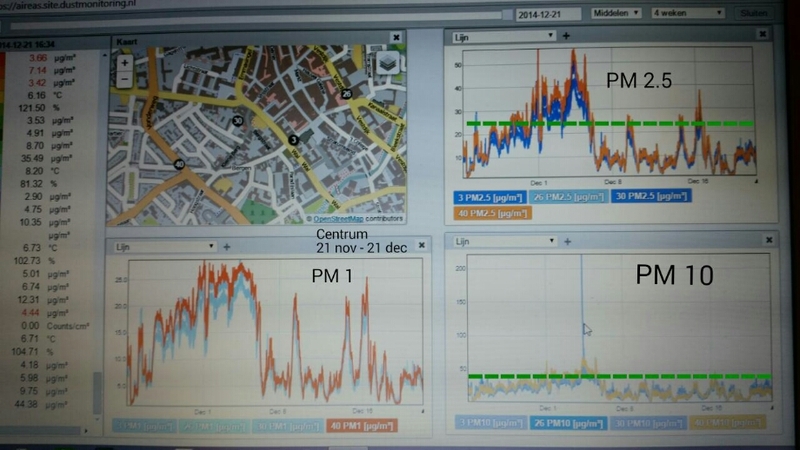 This Innovative Air Measurement system (ILM) is co-created by the multidisciplinary cooperation AiREAS, in which, among others the local city government, the province of North-Brabant, enterprises like Philips, Imagelabonline and Imtech ICT, universities of Utrecht and Twente, the Academic Medical Centre and Energy research Centre Netherlands (ECN) participate. ECN is responsible for the development of the sensors. The design and development of a low cost but reliable and validated NO2 sensor encountered a lot of struggles but ECN managed to overcome them and created a sensor that delivers quality information. This NO2-sensor is now installed in 5 AirBoxes across the city. With the information the local governments can take measures and do research on the effects on health, or adapt the traffic management. The data are publically available via http://www.aireas.com, allowing civilians and business enterprises to also contribute to the improvement of their living space.